Many of our articles are inspired by the cars we spot in and around Los Angeles. Your author has encountered cars as diverse as a Bugatti Veyron, a Jaguar XJ12C, and a Fiat Multipla — not at car shows or museums, but parked on the street or driving in traffic. Every so often, we run across something exotic enough that even we can’t immediately identify it — something like this Autobianchi A112 Abarth. We must admit that we didn’t immediately recognize this little car and it took some research to determine exactly what it was. Our first thought was that it was a Fiat of some kind, which was almost correct. 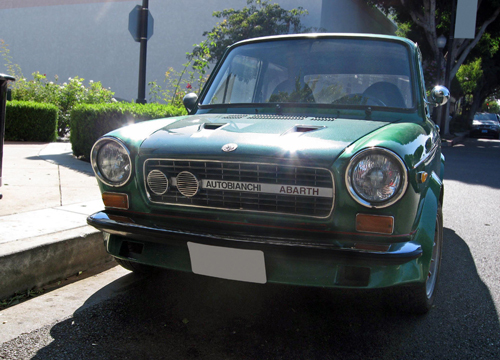 In fact, it is a 1972 Autobianchi A112 Abarth, a mouthful of a moniker that bears some explanation. The Autobianchi A112 Abarth is a little bigger than a BMC Mini, but not by much: 127.6 inches (3,240 mm) long on an 80.3-inch (2,040mm) wheelbase, tipping the scales at around 1,600 (725 kg) with a fuel tank of fuel. It has disc/drum brakes, MacPherson struts up front, and wishbones with a transverse leaf spring in the rear. If you have any interest in bicycles, you may recognize the name Bianchi, an Italian manufacturer of high-end racing bikes. The Milanese company, which holds the distinction of having offered the world’s first bicycle with pneumatic tires, was founded by Edoardo Bianchi in 1885. Two years later, the company introduced a three-wheeled motorbike and in 1901–1902 developed its first automobile. In 1905, Bianchi was reorganized as S.A. Fabbrica Automobili e Velocipedi Edoardo Bianchi & Co., offering a variety of products and even undertaking some racing. During the first World War, Bianchi produced military vehicles for the Italian army, returning to passenger-car production after the war. However, the company fell on hard times during the postwar depression, which was difficult for all makers of expensive cars. Bianchi was forced to concentrate more on motorcycles and bicycles than cars, although the auto business had recovered somewhat by the mid-thirties. Like many automakers of the Axis nations, the Bianchi works were targets of Allied bombing during World War II, leading to the near-total destruction of the Milan factory in 1943. By 1946, Bianchi had returned to production, but Giuseppe Bianchi, son of the founder, decided to drop the passenger car lines to focus instead on bicycles and commercial vehicles. In the fifties, general manager Fernacio Quintavalle began exploring the possibility of returning to automotive production with a new subcompact car. Since Bianchi could not afford such a project independently, Quintavalle negotiated a joint venture between Bianchi, Fiat, and the tire manufacturer Pirelli, dubbed Autobianchi SpA. Autobianchi’s first product was the 1957 Bianchina, which was based on the contemporary Fiat 500. Bianchi’s family, which had owned 33% of the business, subsequently sold their interest in the joint venture to Fiat, which acquired the rest in 1968. Autobianchi’s role in the Fiat lineup was akin to Honda’s later North American Acura division: a somewhat more expensive brand generally selling upscale versions of existing Fiat cars. By the mid-sixties, Fiat was also using Autobianchi as an opportunity to try out new technologies on a smaller scale before introducing them to the mainstream brand. For example, the Autobianchi Primula, which bowed in 1964, actually introduced the groundbreaking transverse-engine/front-wheel-drive layout later used by the 1969 Fiat 128. The three-door hatchback layout was still a novelty in the late sixties and early seventies, but by the time Volkswagen’s rival Golf debuted in 1975, it became de rigueur for subcompact cars. The Autobianchi A112 was available only in three-door form, but the Fiat 127 that shared its platform and body shell was also offered as a two- or four-door sedan. Fiat advertising claimed the 127 and A112 made 80% of the body available for passenger and cargo space. A few years earlier, the BMC Mini had demonstrated the packaging advantages of a transverse engine and front-wheel drive. By consolidating the entire drivetrain into a single compact unit, the rest of the body’s volume is available for passenger space. The problem with that layout, however, was what to do with the transmission. Alec Issigonis, designer of the Mini, opted to mount the transaxle in the engine sump, sharing its oil supply. This was compact but problematic; engines and transmissions have very different oiling requirements and requiring them to share lubrication results in compromises that are satisfactory for neither. Such an arrangement also tends to be noisy because of the need for transfer gears between gearbox and differential. Fiat engineers wanted the space advantages of a FWD layout, so they opted to offset the transversely mounted engine and mount the transaxle next to it, driving the front wheels through unequal-length halfshafts. This provides a powertrain package almost as compact as that of the Mini, but with no need for transfer gears nor any of the drawbacks associated with putting the gearbox in the oil pan. The layout did have its limitations, including poor access for repair and maintenance and a tendency of the unequal-length halfshafts to exacerbate torque steer, although with well under 100 horsepower, the latter was not a great problem for most small FWD cars. (The Primula had a 1,221 cc (75 cu. in.) four making no more than 65 PS (48 kW). The Autobianchi A112, introduced in October 1969, applied the technology of the Primula on a smaller scale, becoming the forerunner of the modern “supermini” class. Although it was a very small car, only 127.2 inches (3,320 mm) long and 58.3 inches (1,480 mm wide), its three-door configuration made it usefully versatile, particularly on the plusher A112 E, with its folding rear seat. A curb weight of only about 1,550 lb (705 kg) ensured good fuel economy and sprightly performance even with the modest 44 PS (32 kW) of the standard 903 cc (55 cu. in.) four, adapted from the one in the rear-engine Fiat 850. The A112 was not a sporty car per se, but its fully independent suspension (MacPherson struts up front; wishbones and a transverse leaf spring in back) gave it nimble handling despite the diminutive 135SR13 tires, although with 60% of its weight on the nose, the little Autobianchi naturally tended to understeer. Front disc brakes provided good stopping power. Just as the Mini’s agility had made it a favorite of rally drivers, spawning the Mini Cooper and Mini Cooper S performance derivatives, the A112 soon got its own performance model: the Autobianchi A112 Abarth. The Bolognese firm of Abarth & C. was an early example of what today we would call a tuner. It was founded by former motorcycle racer Karl Abarth. Although Abarth was Viennese, he had worked in Italy in the twenties and resettled there permanently in 1934, becoming a naturalized citizen and changing his first name to Carlo. After the war, he became a director of Cistalia, but after that venture went into receivership in early 1949, Abarth and Armando Scagliarini decided to start their own firm. The company’s new logo was a distinctive scorpion emblem, derived from Abarth’s astrological sign, Scorpio. Abarth & C.’s primary focus was racing; Scagliarini’s son Guido, who had previously driven for Cistalia, won two national championships in 1949 behind the wheel of the first Abarth cars. The firm’s bread and butter, however, soon became high-performance exhaust systems and other speed equipment for street cars. By 1962, Abarth was selling more than a quarter million mufflers a year. 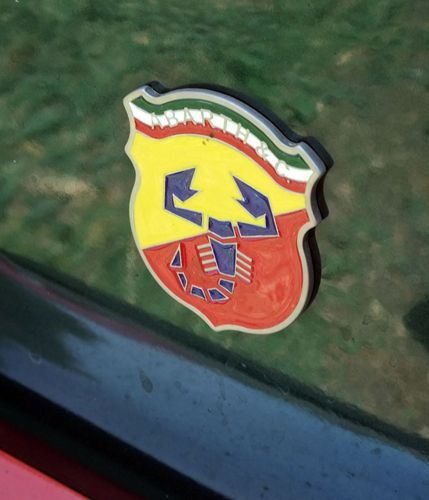 The distinctive scorpion emblem of Abarth & C., recently revived by present owner Fiat. Along the way, Abarth built relationships with other manufacturers and coachbuilders, including Lancia, Fiat, Zagato, Boano, and Pininfarina. Abarth & C. offered highly tuned competition versions of a wide range of cars, from the Simca 1300 to the Porsche 356B. The majority of Abarth’s cars were Fiats — natural enough, given that Fiat was Italy’s largest automaker. By 1967, Abarth had offered more than a dozen Fiat-based models. It should be no surprise, therefore, that Abarth also turned his attention to the A112. In fact, his company built their first prototypes of a hopped-up A112 only a few months after the car’s launch in 1969, fitted with a race-tuned version of the four-cylinder Fiat engine Abarth had already developed for the company’s other products. By this time, however, the company was not doing well financially despite its strong reputation. Abarth’s cars had won thousands of races, but that wasn’t enough to keep the business afloat in a very competitive market. Abarth, then in his sixties, decided he’d had enough. In the summer of 1971, he sold the company to Fiat. A short time after that, Abarth and his wife moved back to Vienna, where he died in 1979. After 1971, Abarth effectively became Fiat’s performance division. One of Abarth’s first post-buyout models was the Autobianchi A112, introduced at the Turin show that fall. The production A112 Abarth used a long-stroke 982 cc (60 cu. in.) version of the standard engine, fitted with twin Weber 32 DMTR carburetors, a higher compression ratio, a hotter camshaft, an oil cooler and heavy-duty radiator, and of course an Abarth exhaust system. In this form, the engine was rated at 58 PS (43 kW) and 54 lb-ft (74 N-m) of torque. This was accompanied by a sport suspension and sport seats, a new instrument panel with full instrumentation, a slightly taller final drive ratio, an oil cooler, and a brake booster. The extra equipment only added about 45 lb (20 kg) to the A112’s curb weight, so power-to-weight ratio was much improved, trimming about 3 seconds from the standard car’s 15-second 0-62 mph (0-100 km/h) times and bringing top speed to about 93 mph (150 km/h). Although not outstanding by today’s standards, this was fine performance for a small European car of its era. List price was 1,309,000 lire, representing a premium of about 25% above the standard A112. In early 1975, a bigger, 1,050 cc (64 cu. in.) engine with 70 PS (51 kW) and 63 lb-ft (85 N-m) of torque became optional on a new model dubbed A112 Abarth 70; the smaller-engined version, now called A112 Abarth 58, remained available through 1976. The big-engine Abarth was about a second quicker to 62 mph (100 km/h) than was the original and had a top speed of almost 100 mph (160 km/h). A five-speed gearbox became available in 1979, when the A112 line got its fourth modest facelift. (Three previous revisions had occurred in 1973, 1975, and late 1977; two more followed in late 1982 and the spring of 1984). Ground effects and spoiler border on the ludicrous for a car with a top speed under 100 mph (161 km/h), but helped to distinguish the Autobianchi A112 Abarth from the mundane A112, which was of prime importance to Fiat. The rear fog lights on this car were required in some European markets. The A112 was quite successful and competition A112s would be popular rally cars throughout the seventies, even leading to the creation of a one-marque racing series. Back in 1969, Fiat had acquired Lancia, and in the mid-seventies, Autobianchi was rolled into the Lancia organization. By the late seventies, Fiat had dropped the Autobianchi brand in many export markets, rebadging the A112 as a Lancia in those markets. 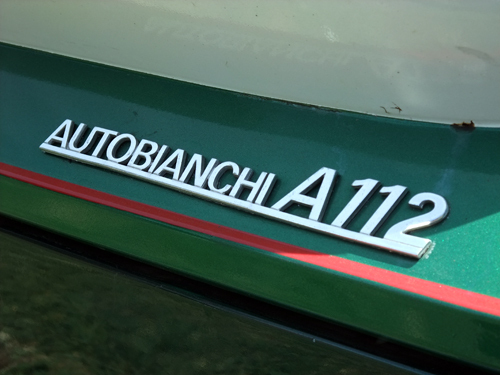 Nonetheless, the A112 remained very popular despite its age. It survived with only modest evolutionary changes through April 1986, selling a total of 1.25 million units. More than 10% of those were the Abarth version. The Autobianchi brand survived in Italy and France until 1995 and was finally dropped when the last Autobianchi model, the Fiat Panda-based Y10, was replaced by the Lancia Ypsilon. Fiat eventually sold the rights to the Autobianchi name to Registro Autobianchi, the official Autobianchi club. Abarth languished after Fiat’s withdrawal from racing in the mid-1980s, but in 2007, CEO Sergio Marchionne announced his intention to restore Abarth to its role as Fiat’s performance arm, establishing new dedicated offices in Turin. Its first products were the Grande Punto Abarth and dealer-installed Abarth SS, offering up to 180 hp (132 kW) from Fiat’s turbocharged 1,368 cc (86 cu. in.) engine. This was joined in the fall of 2008 by an Abarth version of the new FIAT 500 supermini. 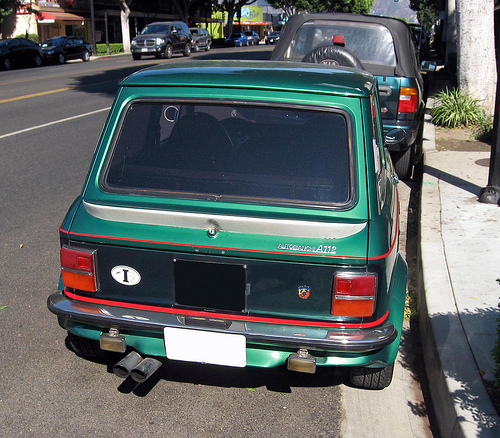 To the best of our knowledge, Autobianchi was never officially imported to the U.S. and we doubt the A112 Abarth would ever have met increasingly stringent federal standards. The owner indicated that it is one of only three of its kind in the States — a rare and remarkable little car. Our sources included “Autobianchi A112” and “Autobianchi A112 Abarth,” Autobianchi Club de France, n.d., www.clubautobianchi. fr/ Presentation_445.html and www.clubautobianchi. fr/ Presentation_448.html, accessed 28 December 2008; Autobianchi SpA/J. Leonard Lang Automobielbedrijven N.V., “Autobianchi Primula” [Dutch brochure AP-7500], August 1966; the Cars from Italy “Other Makes” page, carsfromitaly. net/others/ index.html, accessed 28 December 2008; Mike Covello, Standard Catalog of Imported Cars 1946-2002, Second Edition (Iola, WI: Krause Publications, 2001); Sergiò D’Angelò, ed., World Car Catalogue 1966 (Bronxville, NY: Herald Books/Automobile Club of Italy, 1966); Edwin Storm’s Free Car Brochures website at the Old Car Manual Project (storm.oldcarmanualproject. com); Vignale Gamine, “The Autobianchi A112,” n.d., www.vignale-gamine. com, accessed 28 December 2008; “Historique,” Autobianchi Club de France, n.d., www.clubautobianchi. fr/ Historique_363.html, accessed 28 December 2008; L’Editrice Dell’Automobile LEA, World Cars 1973 (Bronxville, NY: Herald Books, 1973), and World Cars 1979 (Pelham, NY: Herald Books, 1979); Edouard Seidler, “Import Report: A Fiat for People Who Don’t Like Fiats,” Motor Trend September 1969, p. 22; the Sporting Fiats Club’s A112 Abarth page, www.sportingfiatsclub. com, accessed 30 December 2008; “Storia Bianchina,” Bianchina Club, n.d., www.bianchinaclub. com/ ita/ storia-bianchina.html, accessed 28 December 2008; Daniel Vaughan, “1959 Autobianchi Bianchina,” Conceptcarz.com, www.conceptcarz. com, accessed 30 December 2008; and the Wikipedia® entries for Autobianchi and Autobianchi A112 (en.wikipedia.org/wiki/Autobianchi and en.wikipedia.org/wiki/Autobianchi_A112, accessed 11 October 2008). Additional background on Carlo Abarth came from the Sporting Fiats Club’s bio, n.d., www.sportingfiatsclub.com, accessed 30 December 2008; the Abarth Cars U.K. history page, abarthcarsuk. com/ about-abarth/ the-history-of-abarth/, last accessed 5 August 2015; “A Long and Successful History Lies Behind the Revived Abarth Name,” Italiaspeed.com, 26 February 2007, www.italiaspeed. com, accessed 31 December 2008); and Mark Wan, “Grande Punto Abarth,” AutoZine.org, 10 October 2007, www.autozine. org/html/Fiat/Punto.html, accessed 28 December 2008. For the record, AutoBooks, pictured in the background of some of the images, had no connection with this article and we have no business relationship with them other than being a customer and occasionally attending some of the local events they organize. Cool article! I guess I have one of the other two in the country! Mine was imported from Netherlands a couple of years ago. Are we sure those aren’t reverse lights? Possibly added so it could be street legal in the US? I think that the US is pretty much the only country that requires the reversing lights built into the taillight housing, it also appears that they requite two, but this is just from observation. Look at the tail of a European 1st gen. New Mini and you will see a single reversing light (I think in Europe this also lights up red for a rear facing fog/inclement wether light) in the center of the lower bumper. US models have the bumper molded to show where this would go, but have the reversing lights in the taillight housings. Now how far back these regs go, I don’t know (and didn’t try and find out.) If you see the owner of this car again, it would also be interesting to see if he knows whether they are factory or not. Informative as always. Clearly I didn’t do any research on the taillight laws in the US, but just made an assumption based on never seeing ones in the bumper. And now that I type that out I do believe there are some GM cars, Pontiac Grand Prix? that I recall having them in the bumper. Yeah, a number of U.S. models put them in the bumper; either side of the rear numberplate is also common. Mounting the lights in the bumper is not particularly desirable — it means they’ll break in even a minor parking lot shunt — but it’s legal enough. Wow! An A112 in L.A. it’s just too cool! I’m italian, here there’s still some of these cute little cars walking down the road, about 10 years ago they were still one of the most common sights on the streets. This was a really smart and succesful car that appealed both to the ladies for its cute and fashionable style as well to young people seeking for some cheap thrills with the Abarth version. Very well written article, keep up the good work (and don’t be too mean with ’70s personal luxury cars: they were awesome!)! In Europe (and since this car even has the original italian license plate it is originally build according to EU specs) no reverse lights or rear fog lights were required at the time of the A112. I don’t know the precise years but in the 80’s first reverse lights (at least one, colored white) where required and late in the 80’s rear facing foglights (at least one, colored red) where required. There are no requirements for front fog lights in Europe, although in case they are mounted they must be able to operate. Reverse lights have been a populair accessory since the 60’s though. There where also requirement on the location of the reverse lights and rear fog lights (height, side of the vehicle in case of one) but I don’t remember the details. For sure it is not required to be in the light cluster. Most Asian imported vehicles will just get a hole cut in the rearbumper to accomodate a rear fog light to make it a EU vehicle. Great site you have here. Keep up the good work. Yes, you’re right: these are reverse lights. There were no regulations in Europe in those days (70’s) about the strength (lumen) of the lights, the number (you coul have one or two) or the size of the lens. The reverse lights could be put on automatically or manually by a switch mounted on the dash. The only regulation was when to use it. Reminds me of a tiny little critter that you’d think was cute until it bit your wagging finger right off. Nice article and quite a surprise to know there are A112s in the US. The description of the A112’s suspension is incorrect, though. The fron suspension is not double A-arms, but rather a MacPherson setup with coil springs. In the rear it’s an independent Chapman strut with a transverse leaf spring. The A112’s platform in in fact based on a shortened version of the Fiat 128’s. Thanks for the correction! I haven’t reviewed this article in some time and there were a number of glitches. I’ve amended the text. Little FWD B-segment cars like this or the early (first two generations) Honda Civic could be enormous fun to drive. It’s a bit like having a young dog (not a little puppy, but one who’s coordinated enough to not trip over his own feet like puppies do): It may not be that strong or fast, but it’s terribly enthusiastic about everything it does. Rode in Autobianchi in Switzerland in 1977. What a wonderful little car. I would love to own one.